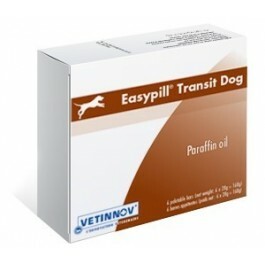 EASYPILL TRANSIT formula for dogs encourages intestinal transit thus supporting digestive health. EASYPILL TRANSIT bars contain paraffin oil to soften the stools, lubricate the intestinal mucosa, and stimulate intestinal transit. 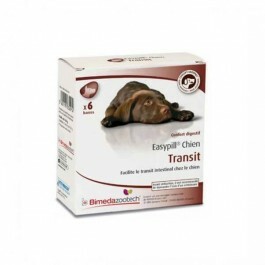 EASYPILL TRANSIT is especially recommended for older dogs or sedentary dogs that may be prone to constipation. The highly palatable formulation of EasyPill means that it is usually accepted spontaneously by the animal. 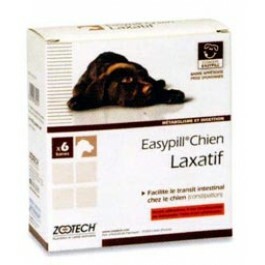 If you are a pet owner who finds tableting their pet a real chore, you can try EasyPill. 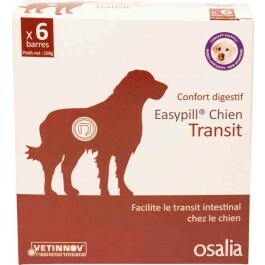 As a highly palatable and pliable tasty treat EasyPill will provide you with a simple rewarding experience so that you no longer have to fear tableting your pet. Poultry meal, water, glucose syrup, rice starch, soybean lecithin, paraffin oil, sunflower oil, palatability enhancer, preservatives, EC-authorised antioxidants and additives. Give 1 portion per 5kg of bodyweight once a day for 5 days, or as directed by your veterinary surgeon. Ask your veterinary surgeon for advice before use or extension of use of this product. Always keep plenty of fresh water available.